The Find Love at Any Age adoption special, which normally occurs on Tuesdays, will be moved to Monday, July 3 for this week only. 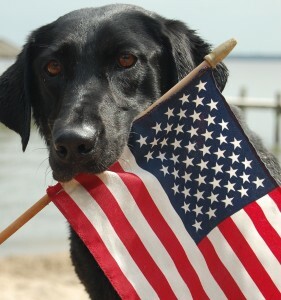 Keep pets indoors: This applies to the Fourth of July and for a few days before and after the holiday if your pet is extremely fearful of fireworks. Dogs and cats who are distressed should be placed inside a room with closed windows and a secure door. A screen door will not stop a frightened dog. Don’t bring your dog to a large commercial firework display. This increases the chances of your pet becoming lost in an unfamiliar area. ID tags are essential: Ensure that all your pets, even those who live indoors-only, are wearing a collar with ID tags that include your current contact information. An identification microchip is even better, as it is embedded in your pet and cannot be lost. Avoid evening dog walks: Walk dogs in the afternoon, well before nightfall, to prevent undue stress from noisy fireworks. In extreme cases, check with your veterinarian about pet-appropriate sedatives or other remedies for your pet. Some dogs and cats may be helped by products such as Thundershirts, available online or at some pet supply stores. Rescue Remedy, and pheromone sprays (Feliway, Adaptil), available at the OHS retail store, may also help calm some pets. Immediately check with your local animal control agency first. Find a local agencies here. (By law, stray and found pets must go to county shelters first; they cannot be accepted by private shelters like OHS). Put up flyers around the area with a photo and detailed description of the missing pet. Craigslist offers free lost and found pet postings. Your neighborhood NextDoor website could also be helpful. County shelters typically offer online lost/found listings as well as physical lost/found references at their shelter locations. OHS and Portland Fire & Rescue have teamed up to encourage everyone to be safe with fireworks during the Fourth of July. Find resources about firework safety, legal vs. illegal fireworks in Oregon and more online here. During peak fireworks periods, a new number, 503-823-BOOM (2666), will be staffed by PF&R firefighters working with emergency dispatchers. If it is an emergency, such as a fire or emergency medical problem, call 9-1-1. 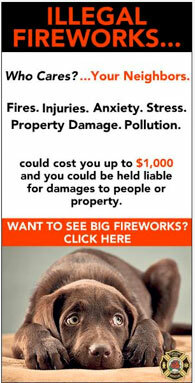 To report illegal fireworks (without fire/injury), call 503-823-BOOM.